This week though not yet ended, had been well spent! Monday a small shopping trip with mom, as usual. Tuesday with YX, another little shopping trip again, hehes and so lovin' the best buy I had gotten-Acid washed & distressed denim high waisted shorts!^^ Still ever in love with high waist shorts~ So many designs and colours and lengths! Gonna get for next year CNY too,hahas. The beer cap badges we gotten from donating a little money, pinned on my bag to fend bad guys,hahas. Get together with the usual company, always daydreamed when looking at the scenery. There's just something about it I can't put my finger on. So surreal. Dinner at Old Airport Rd area, mostly faves food were ordered, heavenly. Tried the Lao Ban beancurd too, seeing so many photos and words about in on Facebook and twitter. Long queue in the evening though, everyone ordered so many at once. Taste really soft and wobbly, like melts when put into my mouth,lol. Today, Nex with mum to watch movie! 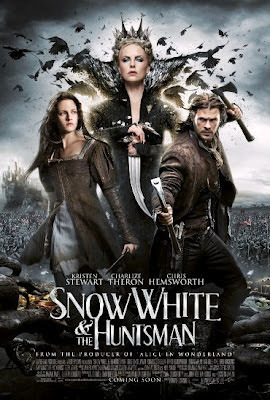 So long since we watched one together, caught Snow White, there's a lot of special effects and killings and shouting, story plot is good, rate it 3.5/5. Though I hope Snow White could get together with the huntsman, sorry hopeless for romantic endings:p The Evil Queen is beautiful though. Bought a few more stuffs and home sweet home. Couldn't sleep well again, so bothered by the workload and doubts.Sigh, this worry thing always gets to me, I blamed the genes. Short getaway would be nice. Heh.